Spray-on products have always been a bit gimmicky. 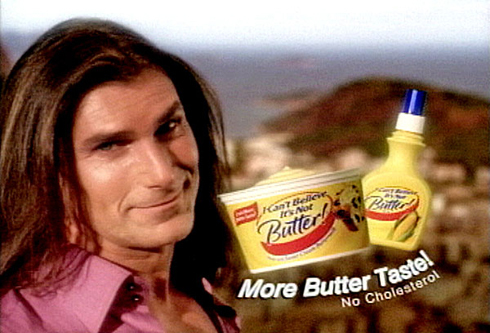 First there was spray-on hair luster, then that butter spray from the guy with the hair, and of course, spray-on latex. Years of disrepute and neglect left the suggested pairing of “spray-on” with any product as an automatic demotion for someone working in the marketing business. That’s all about to change. For those like me who have waited eagerly for nanotechnology to become cheap and ubiquitous, spray-on glass will soon be the first. A subdued reaction is understandable, after all it’s just glass, right? The beauty of this stuff is in the nano-scale. After application it forms an extremely durable and highly flexible film that is one millionth of a millimeter (or around 20 molecules) thick. Its surface is so smooth that on a molecular level there are no pits or cracks where things get stuck. No dirt filled reservoirs means that stains come right off. That’s right, all that’s necessary to remove the worst staining offenders from a treated surface is warm water. It can even be applied to clothes. I know I’m starting to sound like Billy Mays here (still too soon? ), so pardon me for skipping along. The manufacturers at Nanopool claim that their Liquid Glass solution is revolutionizing many of the industries in which it is applied. Cars and trains whose windward sides are coated in it have decreased drag coefficients. Since drag grows exponentially as speed increases, about 60% of the force needed to travel at highway speeds is spent overcoming drag. Less drag means more speed with less power at a higher fuel efficiency. Can you imagine a getting a paint job that improved gas mileage and acceleration? Even better, seeds and plants coated in this stuff grow faster without the need for anti-fungal treatments. It is considered food-safe in Europe, and they are giddy with optimism that it will result in massively increased crop yields. Perhaps the best part of spray-on glass is that it prevents contamination by bacteria. Applying the solution creates an easily cleanable, anti-microbial surface that will last for years. I wouldn’t be surprised if it is being tested as the replacement for the Band-Aid. It can also be used to decrease the risk of infection from invasive medical procedures by coating requisite tools and implants. They pull off this crazy feat in a funny way. The solution is made almost entirely of silicon dioxide (the principle ingredient in glass). It doesn’t require the addition of any binding agents in order to form. In fact, the absence of such substances is the source of its thinness, strength, and versatility. The molecules of liquid glass bind together through natural quantum phenomenon. It’s been tested for use in several markets, and is now generally available in Germany. It will be sold in England in short order, and the rest of Europe is soon to follow. It won’t be long before the entire world reaps the benefits of this spray-on product, and the sour connotation from times past is reversed. ~ by Wil Finley on February 9, 2010. What I am struggling with is since this is breathable, is it also odor permeable? Would that just depend on the size of the molecule that contains (is) the scent? What do you think? Well, part of it being odor permeable means that it is also gas permeable which is one, if not the most important, property of glass (impenetrable barrier to gas). You know, the whole hermetic seal thing. I think that if you were to increase the thickness of the material (spray-on glass) by say as little as 100nm to 200nm that you would find that molecular structure of glass would very quickly disallow the transmission of gases. So yes, if the molecules were small enough and the layer thin enough, they would slip through, however, with increased thickness, overlapping crystalline coverage would inhibit this. You could also look at different amorphous and crystalline arrangements for optimal performance. Really interesting stuff- I’m excited to see where this goes over the next few years. I’ve also heard of “flexible” glass- also on the nano-scale, this material would be used as a one-molecule thick layer in a polymer film. The other materials used in these polymers would make up for any of the deficiencies found in ultra-thin layers of glass alone. Think of it like Lexan-sandwiched bullet resistant materials. Glass shatters to disperse the energy of the round, but the Lexan (polycarbonate) layer holds the glass together and catches the round. That’s interesting. Thanks for the insight. I couldn’t get the image out of my mind of nitrogen and oxygen gas molecules fitting through the holes, but bigger molecules (kerosene for instance) getting stuck like fat cartoon characters. Just heard about this on Skeptic’s Guide to the universe. All of the research backing up their claims is in-house. I’m not saying it doesn’t work, but I’m going to need to see some up-close before I get too excited. Thanks for bringing this up. I’ve debated appending this post with a disclaimer that all of the news of this technology stems from their press release or from articles written directly from their press release. From what I understand, though, this technology is generally available in Germany now and will soon be in England as well, so it shouldn’t be long before we hear testimonies directly from end users. Here’s hoping that the proprietors haven’t been grossly misleading. I will update as additional information becomes available. Thanks again Rumsgone.